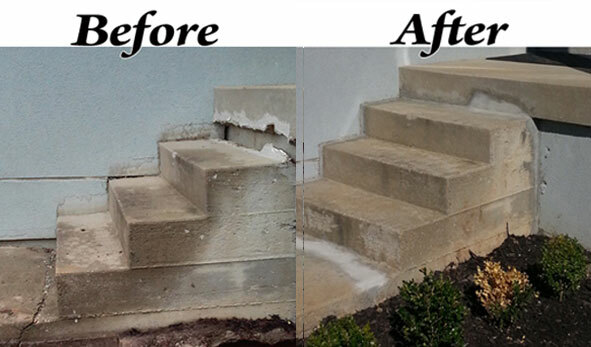 Best Waterproofing Helps Another Customer Save! There are some situations where getting a second opinion is worth the consumers time and money. Take a recent instance at Best Waterproofing. We were contacted by a customer who had a big crack in their front step. They had recently contacted another company in the area, who informed them that it couldn’t be repaired. This resulted in a high dollar bid to remove the front porch and start all over again. Luckily they called us and we were able to provide another solution for the homeowner. With a little investigation we determine the cause of the crack. The crack was due to their downspout draining directly under the concrete steps and sidewalk! Because we were able to determine this as the cause it made the repair easier to tackle. We dug under the sidewalk and installed a drainage pipe out and then down the side of the home. This alleviated the wash out that was being cause due to the original downspout placement. Then our crews dug out under the step and placed a stabilizing pier under the porch and the cracked step to raise it back up. The piers were then concreted in and back filled with gravel and dirt. Then we were able to apply some concrete to the crack in the step and smoothed the entire surface. This corrected the unsightliness of the problem, as well as the piers making the whole porch safe, again. Best Waterproofing was able to determine the reason for the damage, correct the issue and prevented the issue from happening again. All for less than the original quote!